[miau] Play N Go software is quickly making a name for itself in the world of online gaming, particularly when it comes to online video slots software. 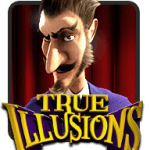 This is certainly the case with one of the company’s newest releases, 5x Magic slots. 5x Magic is basically a no-frills machine that pays off in numerous ways. Part of what makes it so popular is the theme itself, which is like watching an old-school Las Vegas magic show. There’s top hats, the classic bar symbols, a magician, the x5 symbol, and much more. 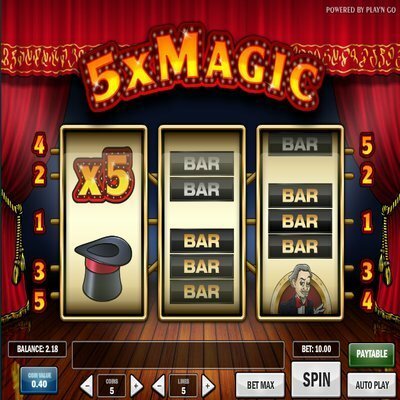 Throw in some decent stakes, and 5x Magic is a great slot machine for gamblers of all stripes and all budgets. One of the strongest features of 5x Magic is actually its payout structure. You see, 5x Magic is what’s known as a high variance game. What this means, basically, is that you can get numerous different payouts in a wide range of different ways. So whether you’re hitting a couple bars and a top hat or the magician and the x5 symbol, you’re going to be winning something. However, understand that a high variance game such as 5x Magic means that, while you might be winning a lot, the actual amount you’re going to win isn’t going to be very high. Other than the main jackpot itself, you won’t be quitting your day job any time soon. Most of the wins are relatively low amounts, typically around 2x the average bet placed. Another area where 5x Magic stands out is in its extreme simplicity. This game is really a classic throwback. While it has quite a few unique symbols, it’s actually only a 3-reel, 5-payline machine, which means that your options aren’t all that varied in terms of customizing your bets or hitting a bunch of wild and scatter symbols for unique reel combinations and wins. On a positive note, this is the classic look and feel that many slots lovers appreciate. On the downside, it means you’re rather restricted on winning combinations. The betting structure of 5x Magic couldn’t get any simpler if Pay N Go tried to make it so. It has a very straightforward way of betting, and players can use coin sizes that range from 0.10 to 1.00, with the maximum bet for any spin being 25 coins. So, if you’re a penny slots fanatic, then this classic game is definitely calling your name. You can tinker around all day without having to worry about spending your entire stack on one game. While 5x Magic does have a wild (x5) symbol and a scatter (magician hat) symbol, there are no real bonus features to speak of. Not only is this game lacking a standalone bonus game, but there also aren’t any free spins for any type of bonus round. This is simply a downside of having a game with such high variance that pays out on so many different combinations. It also isn’t part of a larger progressive jackpot. So, what you see is what you get with this game. You can hit different options to pay out from 2 to 25x your bet, but you won’t find any bonus features.